Needle aponeurotomy (NA) is a minimally-invasive procedure performed under local anesthesia in the office. This procedure is also referred to as “percutaneous fasciotomy” by some surgeons. Using the tip of a syringe needle, the tight cords in the palm are perforated multiple times. Then the fingers are manipulated to rupture the cords, allowing the fingers to straighten. Light wound care and range of motion exercises are then performed, and sometimes a night splint is applied. This is the least expensive treatment intervention for Dupuytren’s and the procedure has minimal downtime. Most patients are advised to avoid heavy use with the hand for one week, but otherwise patients can use the hand for most light activities immediately. NA is performed in the office but it is still considered a type of “surgery” and it has some risks. Skin irritation, pain, bruising, and swelling at the needle sites are common. These symptoms resolve and heal in a few days. Skin tears can occur as well, and these heal with daily wound care within about 2 weeks. More severe complications such as infections, injuries to the nerves and flexor tendons are very rare. Not everyone is a candidate for this procedure. The best candidates have isolated metacarpophalangeal (MP) joint contractures and a palpable cord. Proximal interphalangeal (PIP) joint contractures are more difficult to treat with this technique. 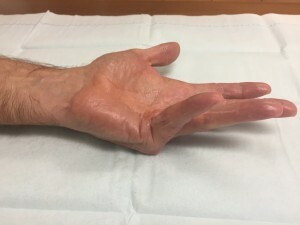 Recurrence rates are high for this technique as well as enzyme injections, but the procedure can be repeated in the future for recurrent contractures. Many patients choose this as an alternative to Dupuytren’s surgery in the operating room. 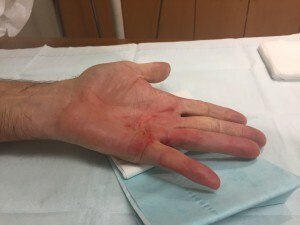 Dr. Erickson uses NA, Xiaflex, and/or surgery to treat Dupuytren’s contracture based on the unique aspects of each patient. See pictures below for before and after NA in a patient with Dupuytren’s contracture treated at Raleigh Hand to Shoulder Center.